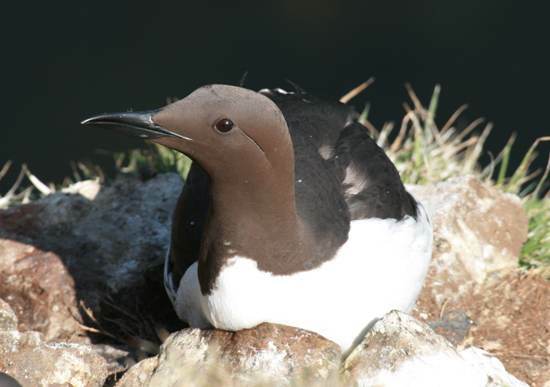 The Common Guillemot (usually called simply Guillemot), like its close relative the Razorbill, is a member of the auk family, but this thick-set seabird is far more numerous around our shores: some 1.4 million pairs of Guillemots breed in UK coastal habitats. When Guillemots stand upright, they bear more than a passing resemblance to penguins, but whereas Guillemots can fly, penguins are unable to do so. 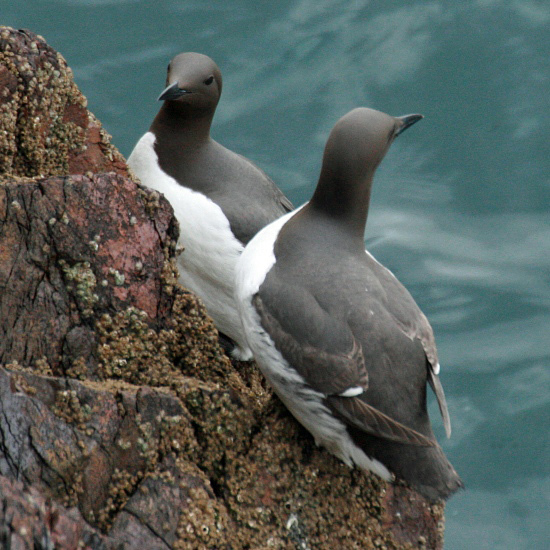 Guillemots are typically 40cm long and have a wingspan of about 65cm (exceptionally over 70cm). Their dark chocolate brown upper plumage distinguishes them from the otherwise quite similar but black-and-white Razorbill. 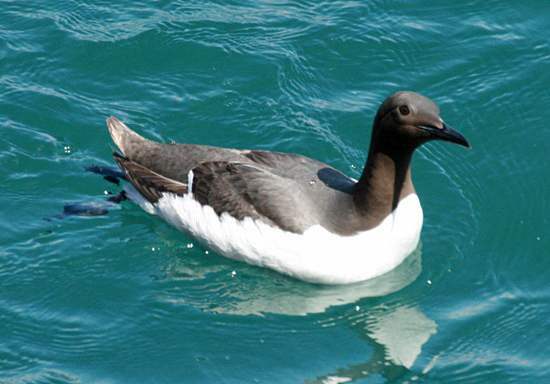 When swimming, Guillemots look and seem to move rather like small chocolate-brown-and-white ducks when viewed from a distance; however, once they dive beneath the surface they are fast and extremely agile, using their powerful wings as paddles. Making no nest, the Guillemot lays a single, large egg, white with brown markings, on a cliff ledge, often with dozens or even hundreds of others packed in close to one another on tiers of such ledges on a rock face. The eggs of this seabird are quite sharply pointed (pear-shaped, or pyriform) and so if they do roll they tend to go in tight circles - a useful feature given the limited space available! Male and female Guillemots take turns at incubating the egg, which takes about a month to hatch.